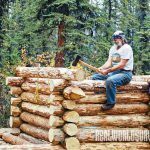 Been-there, done-that advice to help make your off-grid dream log cabin a reality! 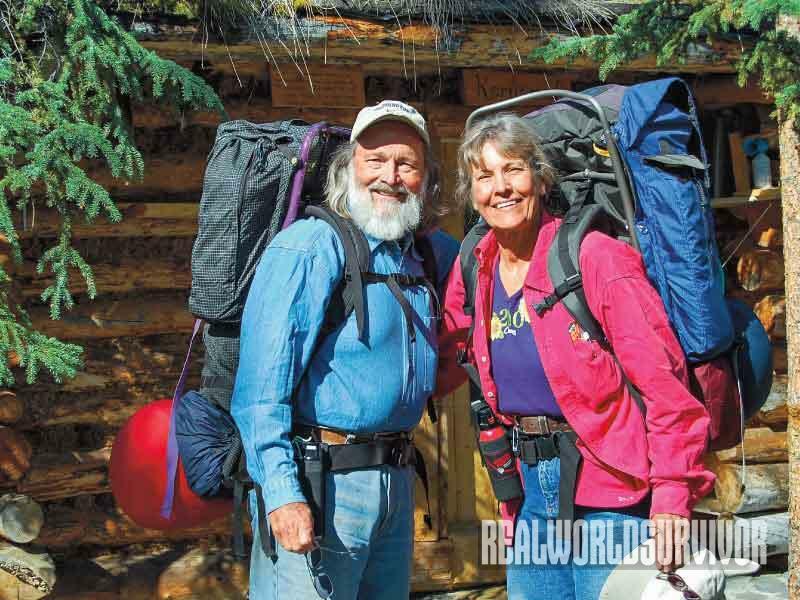 Tom and Jeanie outside of their cabin. During the summer they take long hikes exploring the area, pick berries, fish and watch wildlife. Tom cuts a shallow notch. 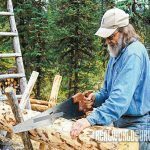 He makes parallel hand cuts, then cleans out the notch with a hammer and chisel. For deep ones he makes border cuts by hand, then uses the chainsaw. The truth is that we are at the time of life when it is appropriate to share our experiences and hard-won knowledge with the younger generation. That is not to say we will never again indulge our fantasies of experiencing the magic of four seasons, dancing auroras and the blissful solitude that only the Arctic offers. 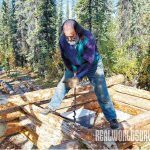 Building a log cabin is like any other physical task: There are tricks learned by “doing” and those revealed to those who have “done it.” Here are some of the tricks and insights that have come my way over the past 22 years of building with trees. 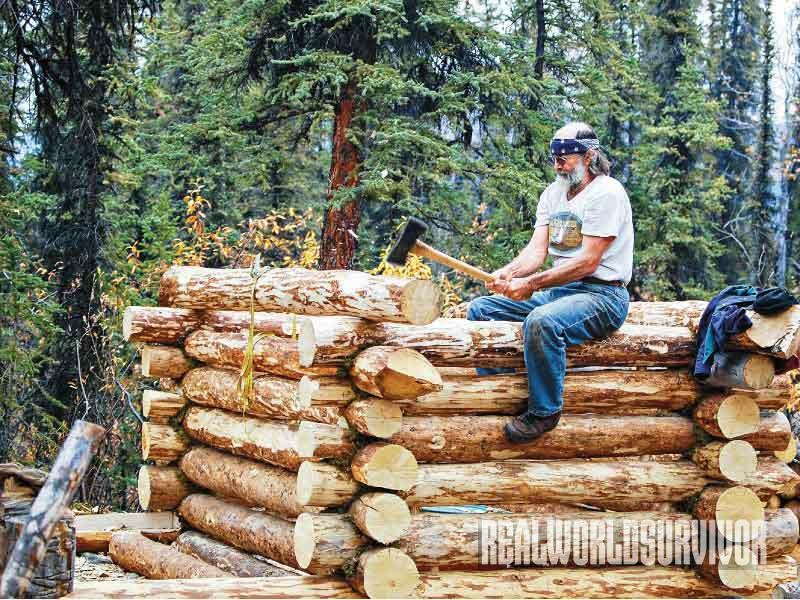 This collection of odds and ends is not intended to be an all-inclusive how-to manual on cabin building, but offered instead with the hope that it will make a first-time log wrestler’s experience just a little easier. I’ve found that making a list of all the tools I thought I would need was very important. Then it was easier to research how to use those I was unfamiliar with. 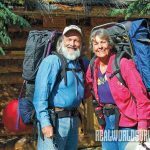 Old timers are a wonderful source for this information and you may hear some grand stories about old-fashioned ways of doing things or how our ancestors lived. Libraries provide a source of knowledge and antique shops offer tools, but you have to be certain both will be usable—many are not. 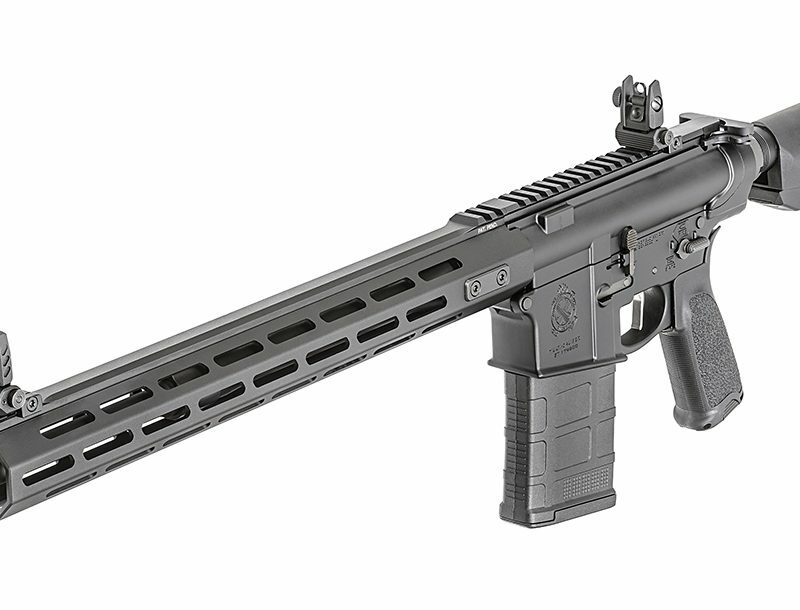 I recommend following up the tool list with one for hardware. 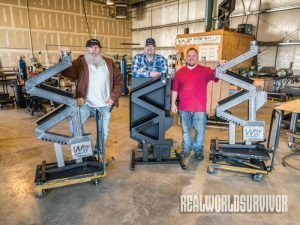 The first item we built was a large sawbuck (sawhorse). 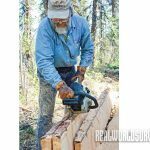 There is no end of uses for this, and having one ready when you start work on the cabin or cabin logs saves time. We use only dead standing trees, leaving the living to the forest. 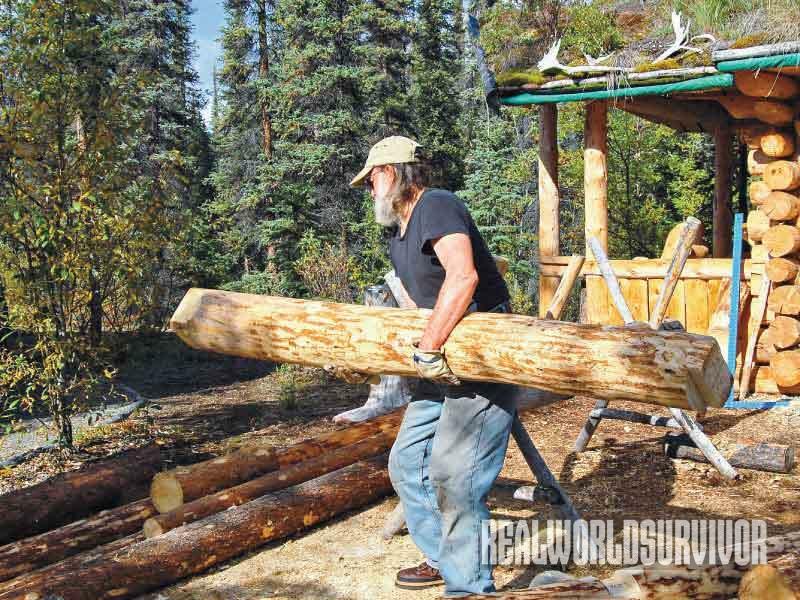 Taking a living tree means far more physical work due to the water weight. A green tree will warp and split when drying, and during the winter it will form ice on the inside wall of a heated structure. If you use a windfall or a log washed up by the river, be sure to inspect it very carefully for insects, rot and sand. Insects and rot make for a weak log, and sand will dull any cutting blade. 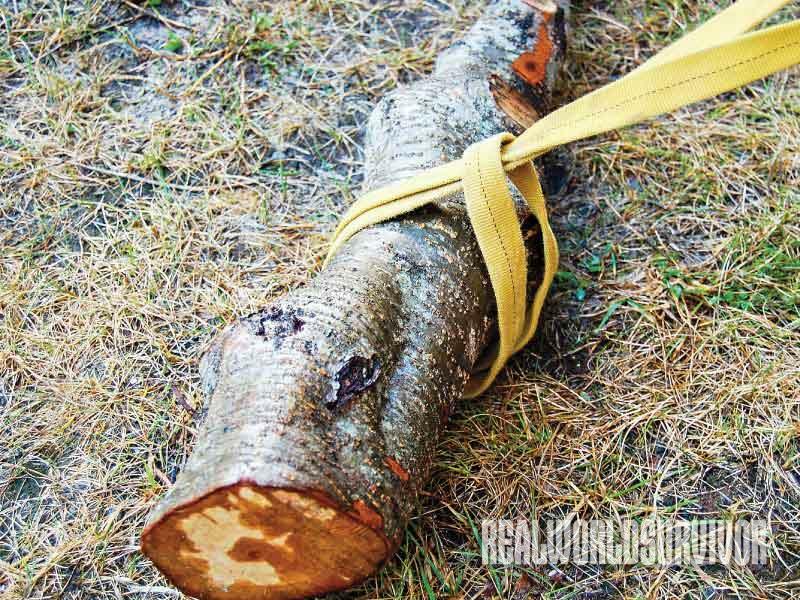 While removing the limbs from a large tree, watch for those that are usable as dowel pins. 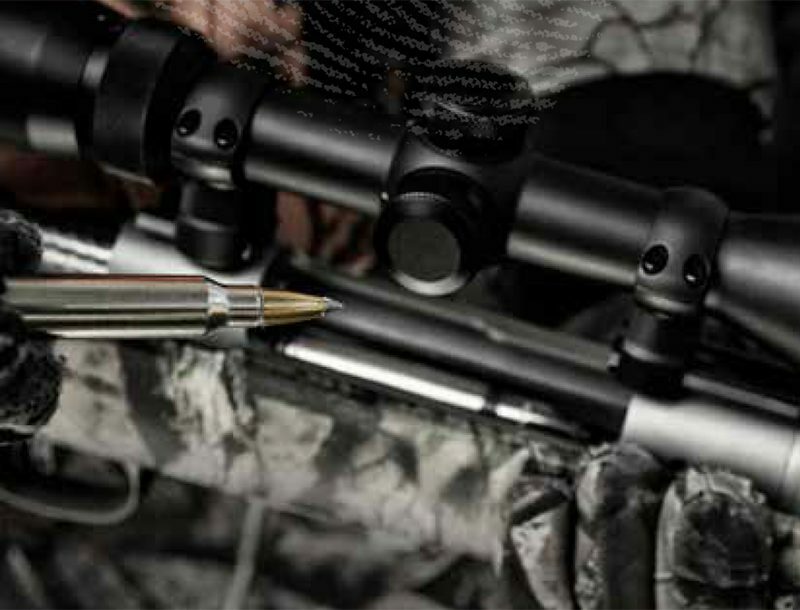 This can save you time searching for them later. Once you have the sill logs secured in position, place the next log on the wall directly above where it will permanently reside, mark the notches with a marking pen, roll the log 180 degrees and use a ratchet strap to secure it to the logs below. 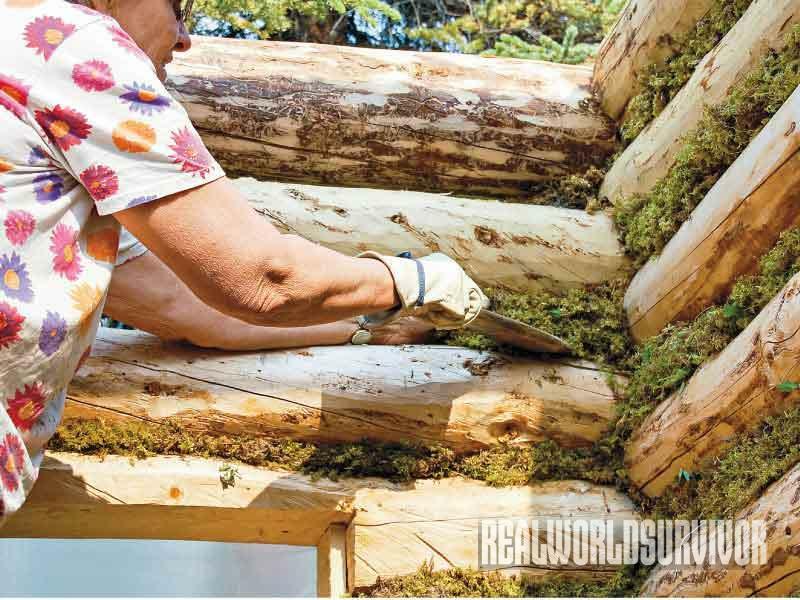 Cut the notches, then rotate the log into position and add moss or your chinking material of choice. On each side of windows and doors, dowel through the log, the one below it, and into a third log. Use a 1.5-inch or larger auger and then pound a dowel into the drilled hole. Be sure that the dowel seats properly. Repeating this with every course (layer of logs) will stabilize the wall when you cut the rough opening. 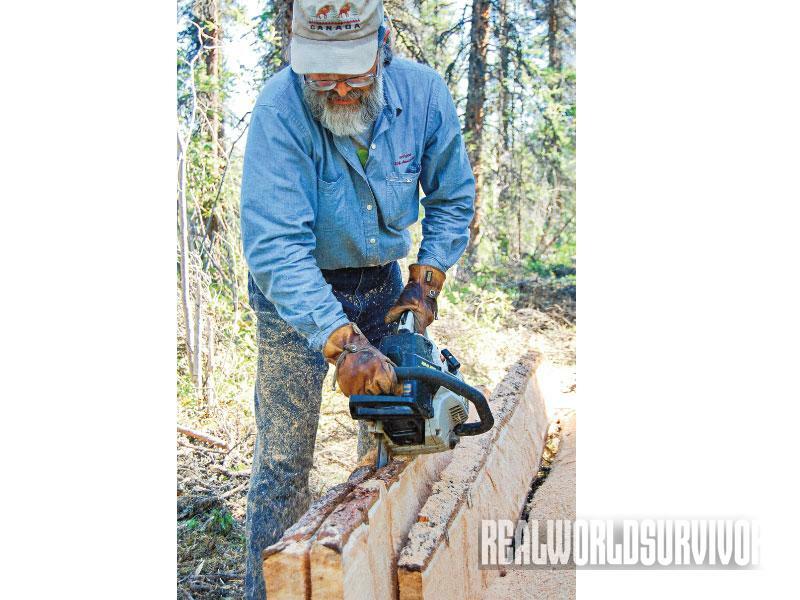 Ripped lumber and “puncheon logs” can be cut without a mill or ripping guide. 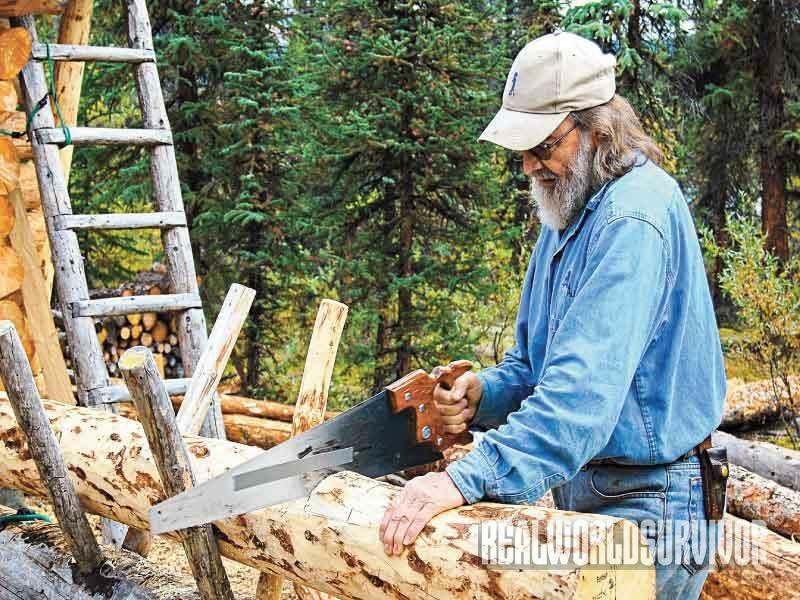 Select two short logs and cut a V-shaped notch in the center of each. The V-notch should reflect the diameter of the logs you plan to rip. These logs will serve to hold the log you wish to rip off the ground. Skin your lumber log and place it in the V-notches. Mark rip line(s) down the length of the log and vertical lines on each end. 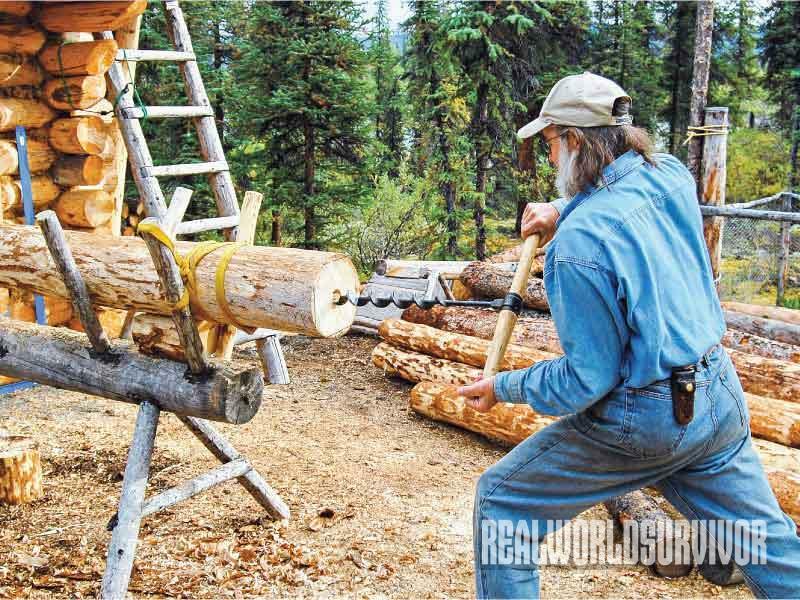 Drive a post into the ground at one end of the log, far enough off center so that it will not be hit by the saw blade. Secure it with a double-headed nail (also called a duplex nail) to the log. 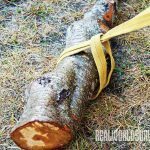 This will stabilize the log as you rip it and make for easy removal of the nail. 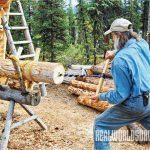 I like to make the end cuts completely through the log and to the full length of the saw bar first, then complete the cut. During construction, remember that the eave support logs need to extend beyond the walls if an overhang is desired. I tend to cut log ends too soon, and that requires some retrofitting. 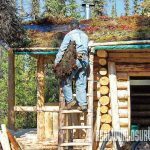 Sod is our roofing material of choice. I put a cheap fiberglass tarp over the crown and multi-fold it because I don’t take the time to smooth and even the rafter ends. Next comes good quality plastic roofing, then another layer of cheap tarp. 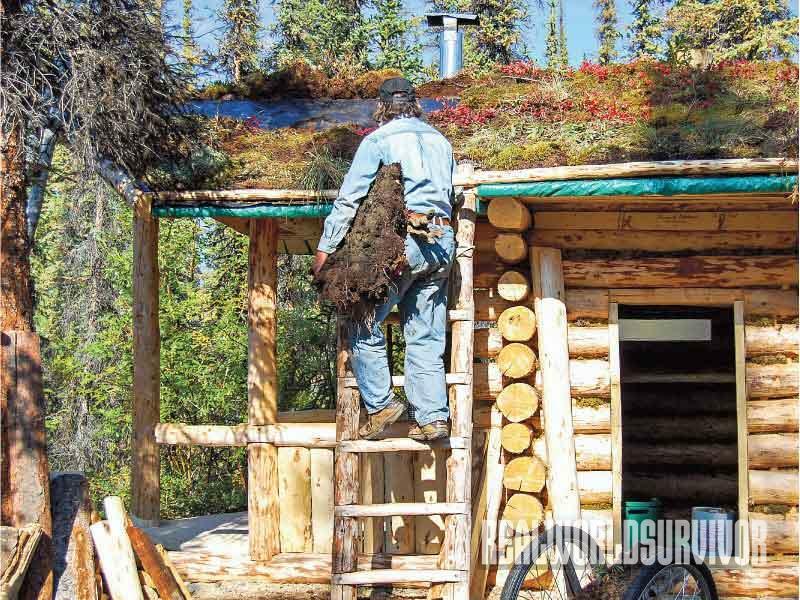 The sod roots will grow into the upper tarp and make a strong bonded surface that extends over the crown. 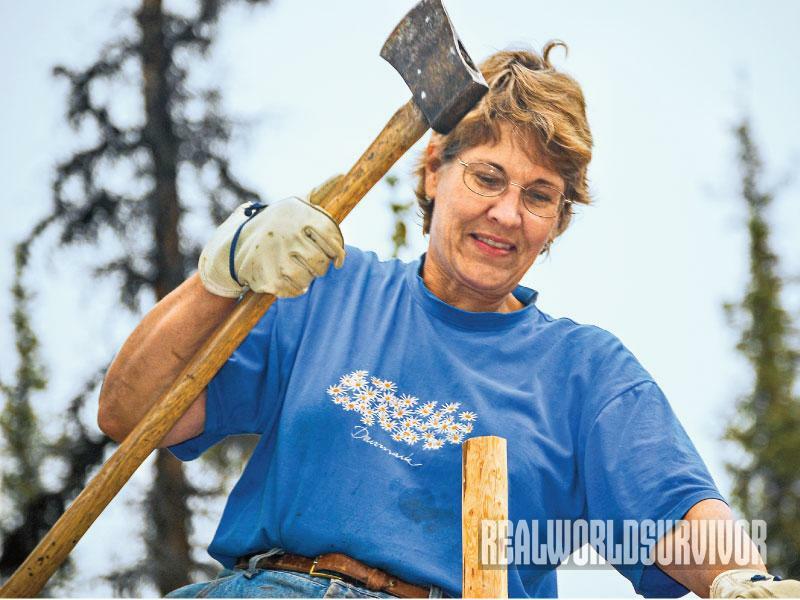 On a steep sloped roof, I use one or more retainer logs to control slippage. 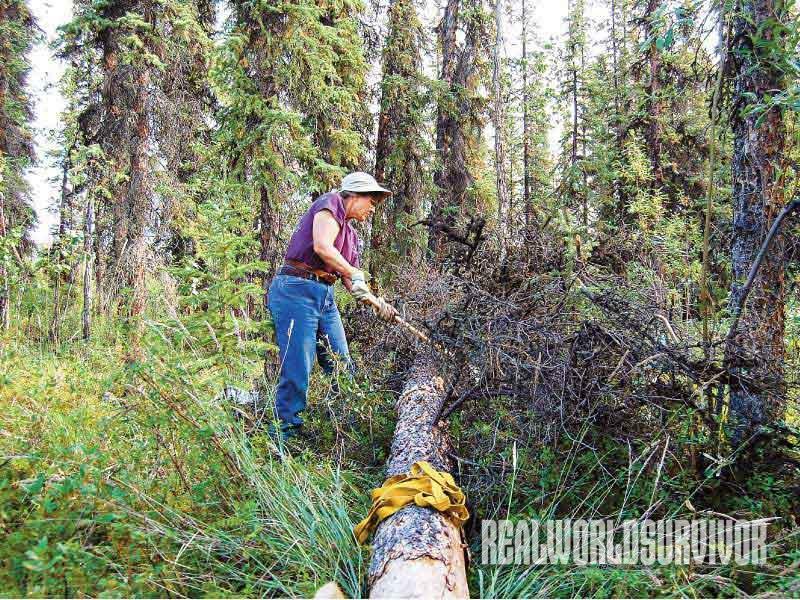 We took 1-inch nylon straps to use for dragging, lifting and securing logs. We bought the nylon in bulk and cut the straps to our desired length (12 to 20 feet did us just fine). Then we sewed the ends together, forming a loop that can be easily and quickly secured around the end of a log. We used a cow hitch—a quick on/off that tightens with pressure but is easy to remove. After felling a tree, limbing it and dragging it out of the forest, we sometimes return to carry the limbs, bark and spruce needles to the river’s cut bank where they will await the spring flood. 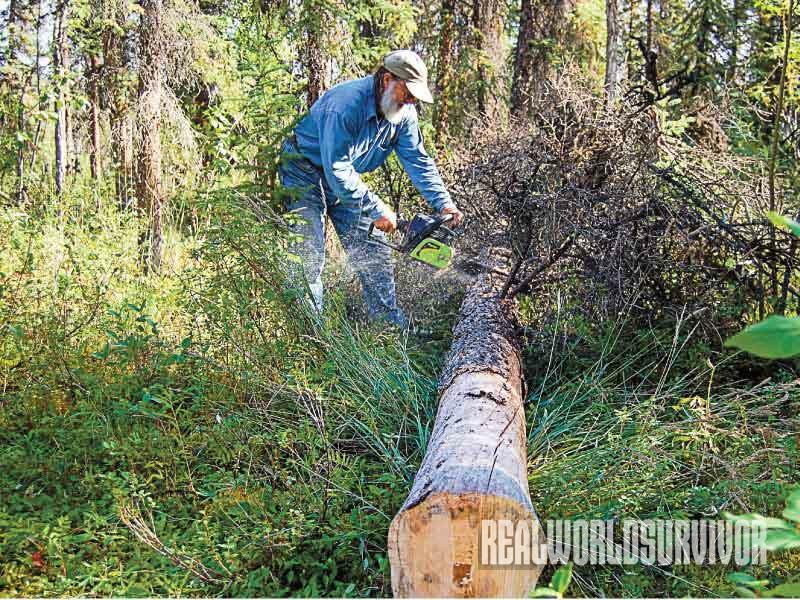 This gives the forest floor a better chance of rebounding stronger and more quickly, and it aids the mulching of gravel bars and islands down river. 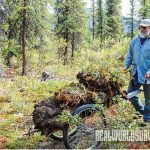 If you want the local forest to retain the nutrients from the tree, just spread the items about in a thin layer so as not to impede the natural growth. 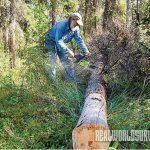 Removing the bark from a log at the fall site will make dragging it easier and leave less duff in your cabin yard, but this places on you the responsibility of cleaning up if you wish to be a good steward of the area. We use moss, the material available in our locale. 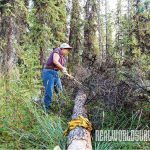 We fashioned a tool to pack the moss between the logs horizontally. It forces the moss between the logs in a longitudinal direction. The tighter it is packed, the better the insulation. If you try to push the moss between the logs any other way it will simply fall through the wall. Other materials for chinking that work: cement, insulating foam of numerous types, clay, burlap or felt. I found that it is easier to use full-length logs, not pieces, in walls where doors and windows will be placed. After the logs have been notched and pinned to at least one course above the opening, mark and cut the rough opening. This lends stability to the wall and to the log as you are working on it. 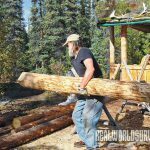 I like to cut the headers before securing the log in place. That way I do not have to work over my head with the chainsaw. 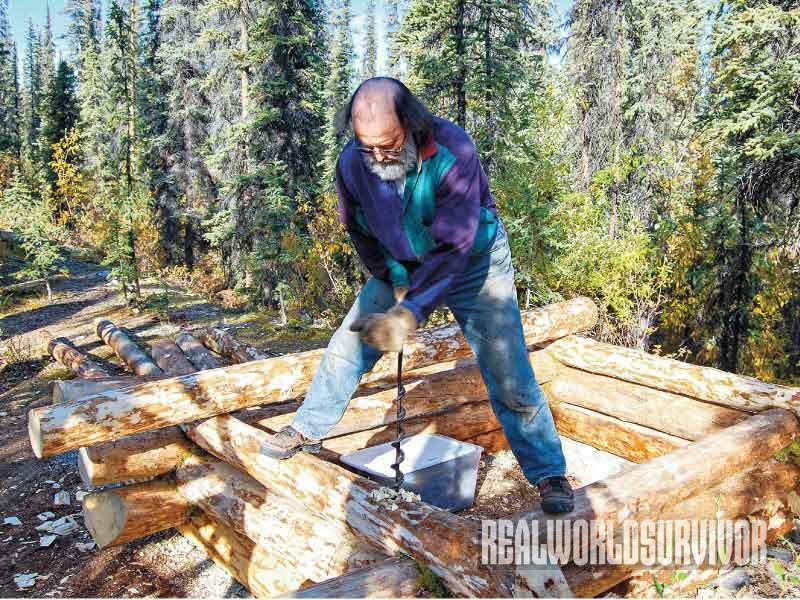 The use of double cribbing when setting the gable logs makes for a safer and easier installation. 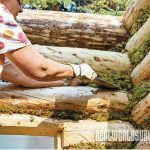 I use the term “cribbing” here to mean small logs or boards temporarily affixed to either side of a wall to keep the next log up from rolling off the wall. Straight limbs or tree tops and slings, bungies or ratchet straps work well for this. Be aware of what works for you and what doesn’t. 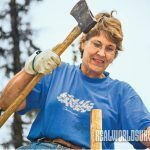 One of the best things about building in the wilderness (or beyond your neighbors’ view) is that you can do things your way. I was very conscious of having no training and little experience, but I found that if I allowed myself, I could be creative in figuring out ways to do almost anything. There are a multitude of ways to build and not necessarily any “right” way. If your method gives you a result you like, that is all you need. Remember to work slowly, safely, and with joy in your heart. 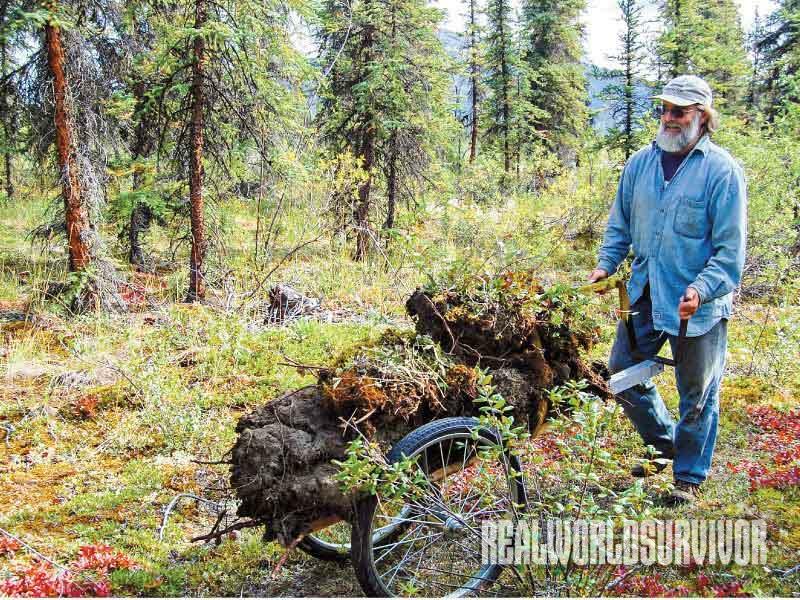 This article was originally published in the NEW PIONEER ™ Summer 2015 issue. Subscription is available in print and digital editions here. WiseWay’s revolutionary, non-electric, portable pellet stove brings on the cheap heat and so much more!